Standard Fruit Basket apples, pears, pinapple, grapes, bananas, oranges, satsumas etc....but bigger and with more exotic fruit than our pretty basket. Will also include fruit such as plums, kiwi, nectarines etc. 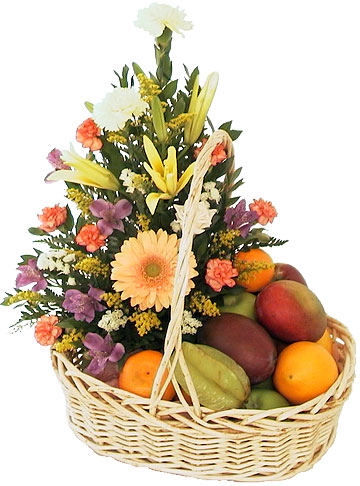 Nicely presented in a wicker basket with a big bow and delivery to the door. A lovely idea gift if you want to send something a bit different! Includes a gift message card. Send fruit in Essex for all occasions including get well, Birthday, Anniversary, Christmas etc. 5% online discount and free delivery in our flower delivery areas including Braintree, Witham Chelmsford, Great Notley, Black Notley, White Notley, Great Baddow, Cressing, Silver End, Kelvedon, Feering, Tiptree, Great Braxted, Great Totham, Maldon, Little Baddow and Coggeshall and Danbury and surrounding towns and villages.